Congressional Wrangling Over Obamacare Repeal Could Drag On For Months : Shots - Health News The Senate has voted to send a bill repealing and replacing the Affordable Care Act to the floor for debate. But with multiple bills in play, it could be months before legislation actually emerges. 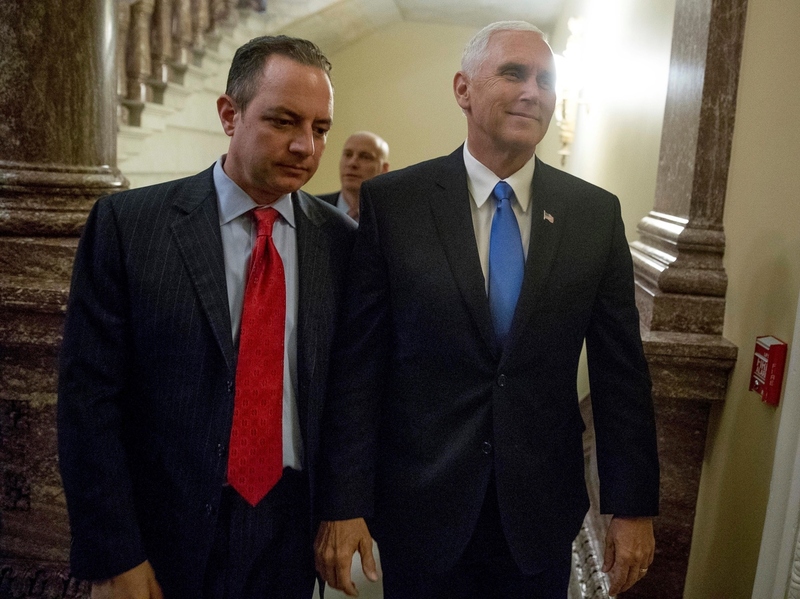 Vice President Mike Pence, right, and White House Chief of Staff Reince Priebus arrive on Capitol Hill on Tuesday for the Senate procedural vote on health care overhaul. Senate Majority Leader Mitch McConnell then will present an amendment containing the second bill considered by the Senate along with the Cruz amendment and another provision on Medicaid. If both of those amendments fail, which is expected, the Senate would then debate the House version of the bill for 20 hours, followed by the vote-a-rama. The House bill likely does not have the votes to pass, but McConnell has a "skinny repeal" up his sleeve that he could use as a final offering at the end of the vote-a-rama. Essentially the most pared down version of what Republicans say they can agree on — which would simply repeal the individual mandate and employer mandates and some of the taxes in Obamacare. The goal, I am told, is to just get something through the Senate that will then allow Senate Republicans to go into negotiations with House Republicans and see if the two chambers can ultimately come up with a bill that they can pass. The bottom line here is if they do pass some kind of a health care bill later this week, it means that the health care fight in Congress is likely going to continue into the fall and maybe well into the fall. In other words, McConnell assumes skinny repeal would pass the Senate. Then, because the House would almost certainly not pass such a pared-down version of repeal and replace, the House and Senate would have to form a conference committee. That committee would craft what could be a wholly new bill on which both chambers would then vote. Then it would go to the president. The American Health Care Act, the House bill passed on May 4. The Senate chose to write its own bill rather than amend this House version. The original: Introduced June 22. It differs from the House bill in key ways, see the chart below. Revision #1: Introduced July 13. Added a provision called the Cruz amendment, championed by Sen. Ted Cruz, R-Texas, that would allow insurers to offer skimpier plans and is widely disliked by industry and consumers, but appealing to conservatives. The version also added money for opioid treatment, a provision to give Alaska more federal funding and other, smaller changes. The Obamacare Repeal Reconciliation Act, ORRA, a repeal-only bill that would phase out the exchanges, subsidies, taxes and Medicaid expansion over two years. It's modeled on the 2015 bill that made it to President Barack Obama's desk, which he vetoed. And here's what's next: Senate leaders say they want to start debate on a bill next week, but it is not clear which legislation might be destined for the Senate floor. The two most likely options for consideration right now are the latest BCRA and the ORRA. Both pieces of legislation have met with opposition, but Senate Majority Leader Mitch McConnell is trying to persuade those holdouts to change their mind and vote to bring legislation to the floor. His argument is that the Senate needs to begin debating and amending a bill in order to pass one. (Note: Republicans have held no hearings on the bills, where a lot of debate would have already occurred). Holdouts could stay opposed, and efforts to move a bill to the floor could continue to go nowhere. But if one of those bills does make it to the floor, there is no way to predict what the final bill will look like. Any senator can offer amendments, and this is where the Cruz amendment could return, as could any others. It's called a vote-a-rama. A few other proposals may come up during this process: On Jan. 23, Sens. Susan Collins, R-Maine, and Bill Cassidy, R-La., introduced a bill that lets states keep the ACA if they would like to. On July 13, Cassidy and Sen. Lindsey Graham, R-S.C., announced an amendment that would give states a block grant to decide how to spend vis-à-vis the Affordable Care Act. It did not include any changes to Medicaid. And even the way the repeal-only bill may be considered (because it's from 2015) is by getting the House's bill to the floor and then amending to swap all its language for that of the repeal-only bill. The vote-a-rama usually ends with an amendment by the leader that cleans it all up and kicks out any offending provisions. Skeptical lawmakers may not want to go this route, because it could easily end with them getting pressured to vote for a bill unlike anything they've yet considered and one they may not be happy with. Additional reporting by Susan Davis and Tamara Keith.